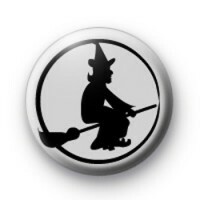 This badge is a Black Silhouette of a Witch flying on her broomstick, ideal Halloween pin badge, when you think of Halloween Witches are top of the evil list. They have so much fun casting spells and getting in to mischief. They are such a popular costume choice and if you are dressing up as one make sure you get your black cat badge too!